We’d understand if you were skeptical of a plumber’s drain cleaning service. Can we really do something all that different from what you can do? Are we just selling you a bill of goods? Well, to help clear up your possible suspicions, we’re going to walk you through exactly how our plumbers get into and clean out your pipes. Here’s the technology, techniques, and best practices we bring to every job, guaranteed. A rooter machine is a kind of plumber’s snake, or auger. It consists of up to 100 feet of coiled, flexible metal cable less than an inch wide. An expert technician fits the bladed head of this cable down your clogged pipe line. A motor attached at the other end of the cable and operated by the technician continues to uncoil the cable, allowing the head to move further down the pipe. When the head of the rooter reaches a clog, the motor will struggle to keep pushing it through the pipe. That’s when the technician activates the head’s rotation. Metal blades grind up your obstruction. The rooter works the head back-and-forth, making sure it catches any residue left on the pipe walls. Rooters can be used on virtually any obstruction, up to and including tree roots that grew into your main line. That’s how it got its name. After the drain has been cleared, your technician applies Bio-Smart down the pipes to prevent future clogs. Unlike most drain cleaners, Bio-Smart is a safe and environmentally friendly drain cleaning powder. Instead of corrosive chemicals, it uses natural microbes that digest fats, oils, grease, and other organic wastes. When your technician pours these microbes down your drain, they feed on build-up that’s accumulated along your pipe’s walls. Bio-Smart works better than other drain cleaners because it doesn’t just push waste further down the drain. Instead, its microbes actually breaks down waste and dispose of waste. These microbes aren’t acidic, so you don’t have to worry about the cleaner wearing out your pipes. It’s better drain cleaning through the power of science! The techniques we’ve described so far already sound pretty “major,” huh? Well, sometimes it still isn’t enough. If a customer’s pipes haven’t been cleaned in a long time, there may be a lot of different sources of clog or slowdown. If that’s the case, we bring out the big guns. These are our drain-cleaning doomsday weapons. The “DrainVision” camera system is a camera system specifically designed to fit into sewer lines. Using DrainVision, a Mike Diamond technician can inspect the entire length of your clogged pipe system. The camera attaches to the end of a length of cable. A light at the end of the camera illuminates the pipe, and the camera sends a live video feed to a monitor attached to the system. The technician uses this live video feed to inspect the entire length of the pipe. They’ll be able to point out any obstructions. Ok, but how will the DrainVision actually help clear debris in your pipes? We’re glad you asked! The hydro-jetter is a Mike Diamond technician’s “finishing move.” The jet system attaches to the DrainVision camera equipment. 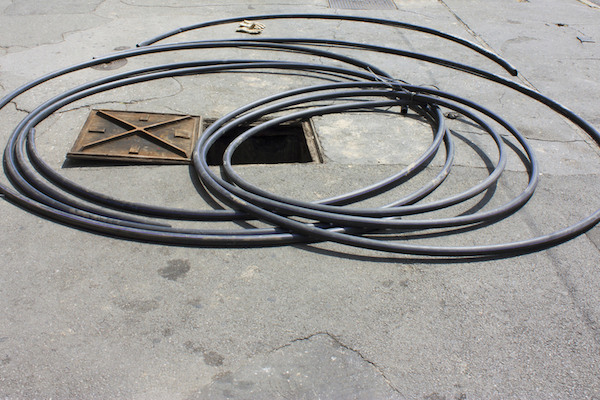 A small, flexible hose runs along the length of the cable. The hose connects several nozzles at the head of the camera back to a tank of highly-pressurized hot water. When activated, the nozzles open, and the hot water in the tank blasts out of them at 8,000 PSI. Using the camera and flexible hose, the technician precisely maneuvers the hydro jets to blast away any obstructions the camera finds. The jets are more than powerful enough to clear any obstructions, including tree roots. When the combination video inspection and hydro-jetting is finished, your pipe walls will work as if they were brand new, guaranteed. When it comes to tools, expertise, and customer service, you just can’t beat the professionals at Mike Diamond. In the 39-plus years we’ve been doing this, we’ve cleaned out literally thousands of pipes. We’re so confident in our process and our people that we offer a $99 dollar stoppage guarantee. 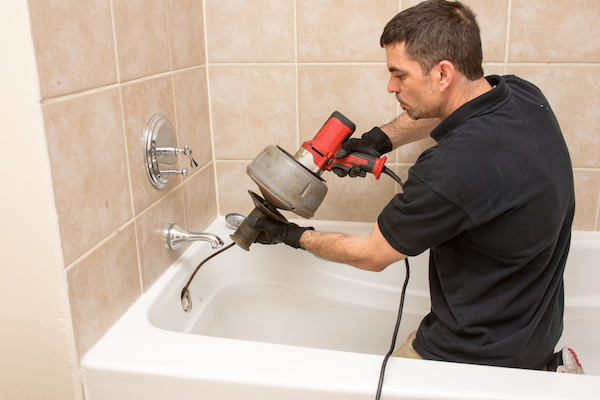 If we finish up and you’re not satisfied with how clean your pipes are, we’ll come clean them out again for free. Whether you need a pipe cleaned, a clog cleared, or you just want to see the hydro-jetter in action, give us a call today. We’ll be happy to walk you through the process in-person.